Grace Hill, 17, says she started mushing two summers ago to get some of the energy out of her two St. Bernard pups. She and her family moved to the Willow/Caswell area when she was 9. They live off the grid with no running water and no electricity. She was homeschooled through the Galena School District and graduated in the class of 2018 at the age of 16. 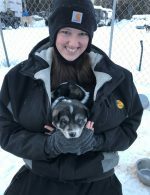 She plans to run the Willow 100, her first sled dog race and looks forward to the Jr. Iditarod. She says she wants to be a nuclear engineer in the Navy or an electrician. And she says she definitely plans to continue mushing.